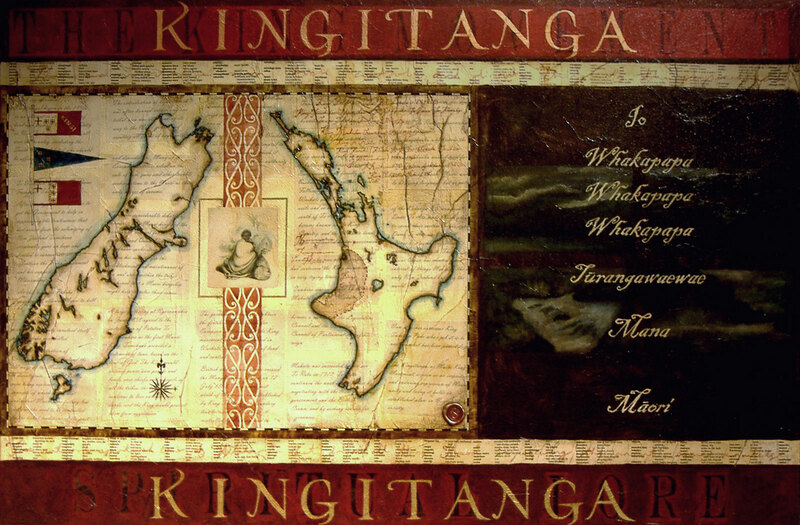 The King movement (Te Kingitanga) began in the 1850s in an attempt to stop the sale of land and promote Maori authority in New Zealand. Tribes from all over the country, including the South Island, debated who should be offered the kingship. Image: ‘Te Werowero, or Potatau the principal chief of all Waikato’. George French Angas delt & lith. Plate 44. 1847. The Three Flags: (top left) Were Te Wherowhero’s for his appointment as King in 1857. Each new monarch has their own flag drawn up for use at Turangawaewae Marae and for visiting other Marae..Kingi (King), Niu Tireni (New Zealand). Kowhaiwhai Design: Patiki (flounder) is a symbol of hospitality.